In a journey of more than 13 years from 14th Nov 2005 till today, F2S team has seen many ups and downs. Here are a few defining moments which have in a way recognised our efforts and strengthened our determination. It was dual celebration for Friendstosupport on 14th November 2018, one, it was F2S 13th anniversary and secondly, we crossed the benchmark of 2,50,000 donors. It feels great for an organisation which started with 5 people to have reached 2,50,000 people today. Friends2support.org founder Mr. Shareef has honoured with "Heroes of Hyderabad Award" by Radio City 91.1 F.M. We dedicate this recognisation to all the 2,00,000 voluntary donors who register with friends2support and saving lives. We are happy to share with you yet another proud moment of Friendstosupport as we listed with Limca Book of Records 2017 as India's Largest Voluntary Blood Donors website. We dedicate this recognisation to all the 2,00,000 voluntary donors who register with friends2support and saving lives. Please click here for more information. On the occasion of The Digital India conclave 2016, Friends2support.org honoured with "Digital Trailblazer Award" from India Today and, Government of Andhra Pradesh for promoting voluntary blood donation using digital technology and social media. Please click here for more information. We are happy to share with you yet another proud moment of Friendstosupport as we listed with Limca Book of Records 2016 as India's Largest Voluntary Blood Donors website. We dedicate this recognisation to all the 2,00,000 voluntary donors who register with friends2support and saving lives. Please click here for more information. On the occasion of Independence Day, Friends2support.org founder Mr. Shareef has honoured with "Real Hero Award" by Big 92.7 F.M. We dedicate this recognisation to all the 2,00,000 voluntary donors who register with friends2support and saving lives. Please click here for more information. On the occasion of World Blood Donors Day, i.e. 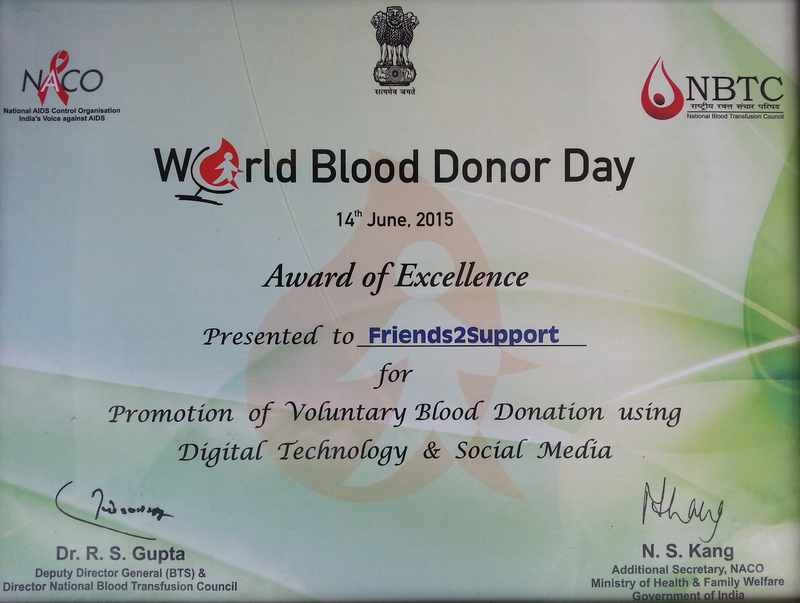 14 June 2015, Friends2support.org honoured with "Award of Excellence" from the Ministry of Health and Family Welfare, Government of India for promoting voluntary blood donation using digital technology and social media. Please click here for more information. We are happy to share with you yet another proud moment of Friendstosupport as we listed with Limca Book of Records 2015 as India's Largest Voluntary Blood Donors website. We dedicate this recognisation to all the 1,50,000 voluntary donors who register with friends2support and saving lives. Please click here for more information. We are happy to share with you yet another proud moment of Friendstosupport as we listed with Limca Book of Records 2014 as India's Largest Voluntary Blood Donors website. We dedicate this recognisation to all the 1,50,000 voluntary donors who register with friends2support and saving lives. Please click here for more information. We are happy to share with you yet another proud moment of Friendstosupport.org as we won prestigious World Summit Youth Award (WSYA) 2013 in the category of Fight Hunger, Poverty & Disease. Friends2support.org mobile applicaitons has selected as one of the best projects from 2500 projects from across the world. The award is a recognition for young people who use Internet and Mobiles to get Action on United Nations Millennium Development goals. Please click here for more information. We are happy to share with you yet another proud moment of Friendstosupport as we listed with Limca Book of Records 2013 as India's Largest Voluntary Blood Donors website. We dedicate this recognisation to all the 1,00,000 voluntary donors who register with friends2support and saving lives. In July 2013, Friendstosupport was adjudged as the winner of "Best digital content used in the development of Society". We are happy to share with you yet another proud moment of Friendstosupport as we listed with Asia Book of Records as World's Largest Voluntary Blood Donors website. We dedicate this recognisation to all the 1,00,000 voluntary donors who register with friends2support and saving lives. We are happy to share with you yet another proud moment of Friendstosupport as we listed with India Book of Records as India's Largest Voluntary Blood Donors website. We dedicate this recognisation to all the 1,00,000 voluntary donors who register with friends2support and saving lives. We are happy to share with you yet another proud moment of Friendstosupport as we got selected by World Summit Youth Award (WSYA) 2009 as one of the Top 5 projects in the category of Fight Hunger, Poverty & Disease. The award is a recognition for young people who use Internet and Mobiles to get Action on United Nations Millennium Development goals. Over 600 projects from across the world participated in this event and we are elated to tell everyone that friendstosupport got an oppurtunity to represent India on a global platform. In the years to come, let us all hope to see many more organisations representing India for a good cause. Thank you one and all who have made this possible. In May 2007, Friendstosupport was adjudged as the winner of "Best digital content used in the development of Society". This was the very first national recognition that Friendstosupport got when it was merely 2 years old. We feel proud to inform everyone that in the year 2009, on 11 of Jan, we were nominated as one of the 4 deserving candidates for the prestigious NASSCOM FOUNDATION Social Innovation Honours in Non Profit category.